Canada recently witnessed its largest act of civil disobedience — ever. On May 22, a reported 400,000 students, teachers and their allies marched through downtown Montreal in a brazen show of condemnation for the recently passed Bill 78, which essentially renders “unauthorized” protests of 50 people or more illegal. This landmark event in Canadian history is part of a much larger story — economically, politically and geographically speaking. It is a story about priorities. University students of Canada’s Francophone province, Quebec, have been diligently protesting drastic tuition hikes (75% over the next five years) since December 2010, when the provincial government announced that it would begin to raise fees for the province’s universities. Fees in Quebec have historically remained low (thanks to pressure from strong and committed student unions), meaning that access to higher education in Quebec notably exceeds that of any other Canadian province (never mind the neighboring United States). But what do the tuition hikes have to do with development? Canada is a “developed” country. Put simply, development is about quality of life. Equitable development then is about improving quality of life for everyone. Human development encompasses health, education and access to goods and services. Followers of a human development approach (for example, the United Nations) contend that quality of life is intimately tied to these things. As a result, Canada’s development agency, the Canadian International Development Agency (CIDA), is engaged in improving quality of life in “underdeveloped” countries. Like other development organizations, it promotes equitable human development in these regions, including equal access to clean water, health care, education and more. But what about equitable human development at home? Development is not an end-goal; it is a process, meaning there is always work to be done. In this case, the work is ensuring that quality of life remains high and is equitably accessible. Quebec’s protesting students are defending their rights to education — and thus to a high quality of life. Their actions should give the rest of us food for thought: as a society, what kind importance do we place on a healthy, well-educated population? The student leaders articulate their cause using the language of inequality, notably standing in solidarity with the Occupy movement. First and foremost, they are rallying against the privatization of the university and the restricted access this will mean for a large portion of potential and current students. However, their critique has also expanded to the privatization of other public services, including health care, a universally accessible service that has traditionally been a source of Canadian pride. In the name of austerity, the provision of public services is under threat, and the students in Quebec are taking a stand. So too are students in Chile and Spain. 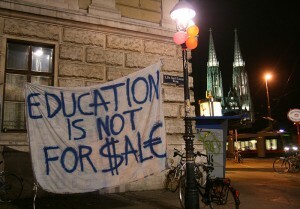 What does it mean to privatize higher education? The privatization of higher education creates weaker links between schools and the federal and provincial governments, and it demands that universities be run like businesses. The university is remade to be more competitive in the “education market,” and the student is viewed as a consumer of a product — in this case, of education. Those departments that are most profitable (business and the hard sciences, for example) are strengthened, while social sciences and the humanities are more likely to face cuts to faculty, staff and resources. Costs are increasingly covered through the raising of private funds (through corporate and private donations) and by the students themselves through tuition hikes. Tuition hikes, of course, mean fewer people can afford to go to university at all. In Quebec, government officials have suggested that an increase in student financial aid should help solve the problem of accessibility. However, financial aid is based on family income, and is therefore available only to those applicants of the lowest economic classes; middle and upper-middle income families are not eligible. While this might seem fair, it masks the reality that, even if they can afford it, not all parents fund their children’s post-secondary educations. There is therefore a large group of young people intent on attending university that is left with only two options: take out student loans, or take out student loans and work on the side. The privatization of higher education in general, and the tuition hikes in particular, have a gendered element, as well. Women in Canada continue to earn less, on average, than men: for every dollar earned by a male, a woman earns 71 cents. A rise in tuition fees then means that fewer women will be able to afford the cost of higher education. In turn, this means that fewer women will have access to better paying jobs that demand post-secondary qualifications. Bearing in mind that half of Canadian students graduate with an average debt load of nearly $19,000, those women who do manage to access post-secondary education will spend a longer time paying it off than will their male counterparts. Political leaders, among others, have commented that “there is no free ride” when it comes to education — it must be paid for. That education has a cost is logical. However, the set of options provided by proponents of this argument — “raise taxes or raise tuition fees” — is distorted. If there is sufficient funding for $9 billion dollars to be spent on fighter jets, or $114 billion dollars on bailing out banks, questions must be asked about why provincial and federal pockets seem to be empty when it comes to education. This is an oversimplification of the issue, but it serves as an example of what might really be at the heart of such arguments: a case of misplaced priorities and a myopic view of what it really means to “invest” in the well-being of a population. Thinking in terms of priorities allows us to consider how the billions of dollars currently raised in provincial and federal taxes might be meaningfully repurposed, away from some investments and into others. If we are talking about human development, about quality of life, then realistic, universal access to education — education that does not come hand in hand with student debt and grim post-graduation employment prospects — must be on the table. Equitable development requires equal access to goods and services. Therefore, public institutions that provide universal access to such things, including universities, must be protected, strengthened and improved. Equitable development is not only something to be worked for in “underdeveloped” contexts, but it must also be defended and struggled for in developed countries. The privatization of education is not in line with the principles of equitable development. The Quebecois student protesters, as well as their allies, have not been granted much in the way of solidarity from fellow Canadians of the Anglophone provinces. This is not only disappointing, but also short-sighted. As members and allies of a generation of young people that has inherited quite the socio-economic mess, we must ask ourselves: who does this proposed tuition hike really benefit? Do we want an increasingly large youth population doubly burdened by debt and unemployment? Does that sound equitable? Does that sound sustainable? Before passing judgment on the Quebecois, or the Spanish or the Chilean student protesters (as spoiled, lazy), perhaps we should think long and hard about where our priorities lie and what kind of future we envision for “developed” nations.